This example illustrates the use of ODS OUTPUT statement to save standardized mortality ratios for different causes and to display these statistics together in a table and in a plot. The Florida_Cs data set contains the stratum-specific mortality information for stomach cancer and skin cancer in year 2000 for the state of Florida (Florida Department of Health 2000, 2013). The variable Age is the grouping variable that forms the strata in the standardization. The variables Event_C16, Event_C43, and PYear identify the number of events for stomach cancer, the number of events for skin cancer, and the person-years, respectively. The COMMA9. format is specified in the DATA step to input numerical values that contain commas in PYear. The US_Cs data set contains the corresponding stratum-specific mortality information for the United States (Miniño et al. 2002; US Bureau of the Census 2011). The variable Age is the grouping variable that forms the strata in the standardization. The variables Event_C16, Event_C43, and PYear identify the number of events for stomach cancer, the number of events for skin cancer, and the person-years, respectively. Output 107.4.2 lists the mortality information by cancer cause. The following statements invoke the STDRATE procedure and request indirect standardization to compute the skin and stomach SMR estimates for the state of Florida. The BY statement requests separate analyses of causes that are defined by the Cause variable. Only the tables and plots that are specified in the ODS SELECT statement are displayed. The STRATASMRPLOT option in the ODS SELECT statement requests that the strata SMR plot display stratum-specific SMR estimates for skin cancer with confidence limits, as shown in Output 107.4.4. 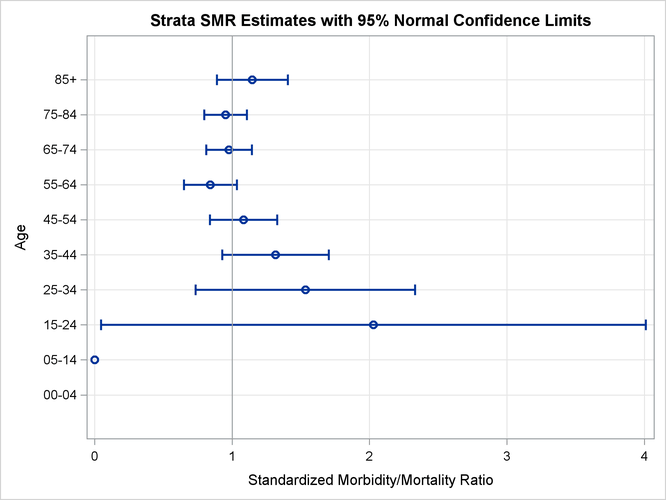 The SMR option in the ODS SELECT statement requests that the "Standardized Morbidity/Mortality Ratio" table display the SMR, its confidence limits, and the test for the null hypothesis for skin cancer, as shown in Output 107.4.5. With the default ALPHA=0.05, confidence limits are constructed. Similarly, the "Standardization Information" table in Output 107.4.6 displays the standardization information for the second BY group, stomach cancer. 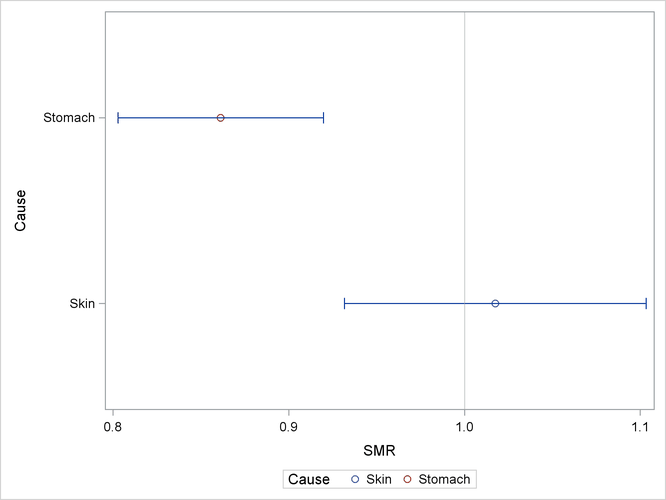 The "Strata SMR Plot" displays stratum-specific SMR estimates with confidence limits for stomach cancer, as shown in Output 107.4.7. 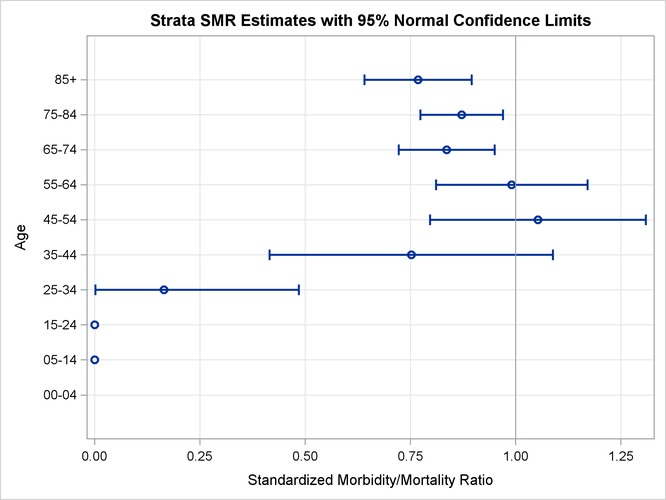 The "Standardized Morbidity/Mortality Ratio" table displays the SMR, its confidence limits, and the test for the null hypothesis for stomach cancer, as shown in Output 107.4.8. The table in Output 107.4.9 shows that the study population (state of Florida) has a higher skin cancer rate and a lower stomach cancer rate than the reference population (United States), but only the lower stomach cancer rate is significant because its corresponding SMR upper confidence limit (0.9199) is less than 1.